George Jones focuses in this article on how to adapt a practice he has seen countless times at all sorts of ages and ability levels throughout England. Many coaches will have seen and most certainly used the above situation, a 4v4 game with bounce/joker players on the outside. These players are often used to retain possession, and normally after a time limit, or after a goal is scored they will swap with the “losing” team on the field. 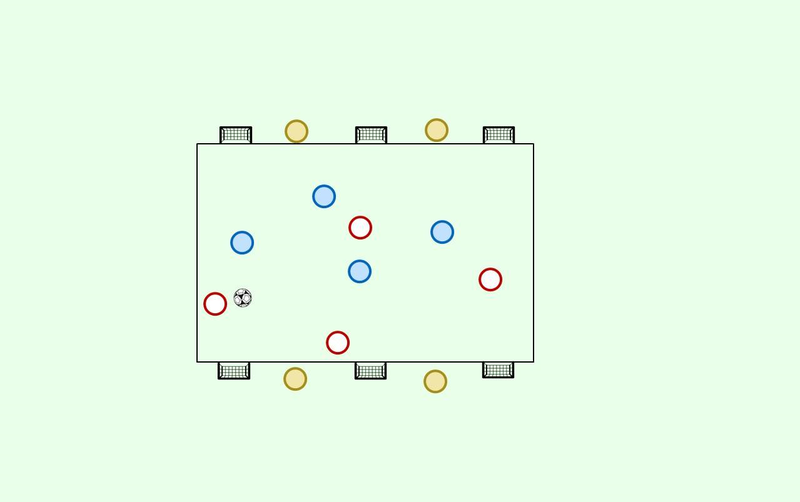 This is a common situation when wanting to finish a session with a 4v4 game, due to numerous factors, i.e., number of players available, space available, and it is easier to place the players on the outside to keep them “involved” with the game, rather than resting. An outside player can be used but cannot pass back to the play he/she received from. An outside player can be used but has to pass back to the player they received from. Obviously, all these different constraints contain different outcomes and it is up to the coach to decide which outcome they want to achieve. The practice I want to discuss is a variation of the practice above. But instead of placing the players on the outside of the pitch, we place them either side of the goal, like so. The first time I saw this practice being used was at a coaches’ development day at a Category 1 academy. The reasoning behind the different placing of the players given was that “It was something different, and a different learning experience for the players”, whilst I agree with the statement, I feel that if we really look at the practice in detail there is so much more we can take from it. Players must pass into the bounce player to be able to score, whether if this is directly from the pass back, or if they are allowed a limit of passes consecutive passes (2/3/4) from the pass before they can score. Players are only allowed to take a certain amount of touches. This increases the likelihood of combinations in the players, and places a greater importance on the structure and spacing of players when in possession. Playing into the bounce player and then scoring leads to two points, playing normally and not playing into the bounce player before scoring equals one goal. I like to use the practice and the constraints mentioned above for many different outcomes that align with my game model. Firstly, placing the players close to the goal, (although not in a completely game realistic situation) encourages my players to play vertically, to the furthest available player because vertical passes are the fastest way to gain space in football. This gives them a reference point when receiving the ball, and implicitly makes them aware of the deepest possible pass. For the players, I work with I try and place an emphasis on orientating yourself to the deepest possible option and this game provides a great starting point for that. The focus on pre-orientation here is so players begin to pre-orientate themselves towards the deepest possible option because by knowing roughly where their teammates are, and where the player will be, they can adjust their body shape to put themselves in the best possible positon to take their first touch towards goal, or towards the deepest option. It Is important to emphasise that on completing the vertical pass the bounce player needs to be supported because of the nature of the bounce player’s position he will receive with his back to goal and maybe unaware of his surroundings. Secondly, I like to play this game in quite a tight space with a touch limit, although the benefits of using or not using touch limits are debated heavily, I feel that they serve the purpose of what I want my players to achieve in this session. By forcing a one or two touch limit on the first few minutes of the game, the players need to combine in tight spaces to move the ball closer towards the goal. Normally, at this point I will go in and explicitly coach where I want players to be positionally in terms of our structure to allow the best progression of the ball. I will often remove the touch limit, and it is great to see the mixture of dribbling quick combination play but I will still ask my players to follow the guidelines of our game model, “as vertical as possible and as horizontal as needed” to keep possession of the ball. The touch limit is simply there to encourage combinations in tight spaces that allow the team to progress the ball towards the goal as a unit before playing the vertical pass. Thirdly, I like how this practice helps the team orientate after winning the ball back in transition. Sometimes I will set one team up so as when they win the ball they must focus on creating structures in possession then progressing the ball before playing a pass into a bounce player. The other team will then be set up to win the ball and play the vertical pass as soon as possible after winning the ball back whilst moving into a position to score. The position of the bounce players also creates a few interesting situations in terms of goal scoring. Depending on the rules, if the rule is to score as soon as you receive it, we may place emphasis on a diagonal cut back, or a ball into a player arriving from deep. This also enables us to focus on the third-man principle and timing of our attacking runs. Below is a further progression when adding two extra goals, a rule I often play with when playing this game is, one point from scoring in the outside goals, and two points from scoring in the central goals to promote a focus towards playing centrally. The point of this article was to take a simple practice, a 4v4 game with players on the outside of the pitch, progressing to putting players into a different situation and adding constrains aligned with a game model to allow much more depth (pun intended) when coaching virtually the same game. George Jones is a coach for a Premier League club. You can find him on Twitter @georgejjones.